The Submariner is one of Rolex's most iconic models. Still in production today, it has gone through multiple incarnations throughout its 65 years history. 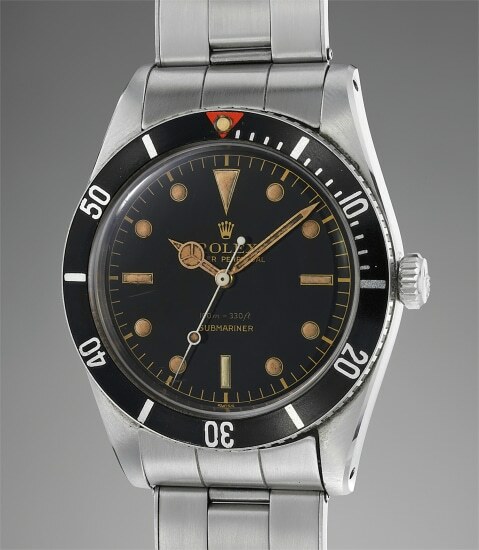 While early generation examples notably had either a "small" or "big" crown, Rolex gradually introduced crown guards in the mid-1960s to make the model more robust and durable. Reference 5508 was manufactured between 1958 and 1962. This Submariner model, nicknamed “small crown” is the last one to carry a 100m depth rating and no crown guards. The present example is presented in an impressively preserved condition. It seems that the watch has spent its life securely stored away from the ocean and worn less than occasionally. The case is as crisp as it was when it left the factory and the fragile bevels that run along the lugs are crisp and sharp. Fitted with a black glossy dial with gilt printings, the watch also displays a perfectly preserved bezel with red triangle and original pearl. It further impresses with a wonderfully firm and tight expandable riveted Oyster bracelet stamped 1.58. Directly coming from the family of the original owner, this 60 year plus Submariner is a preserved gem that could possibly be ready for some action.